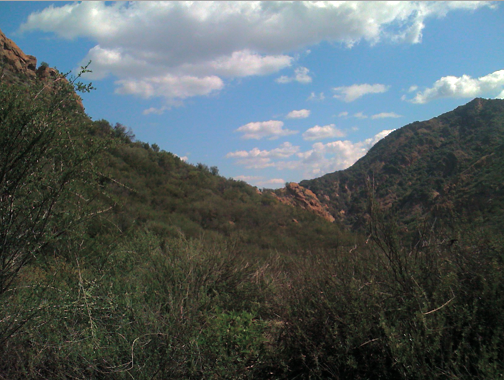 I spent today leading a crew fixing up a trail near the old film set for M*A*S*H. Inside what’s now Malibu Creek State Park, anybody who’s seen the show will instantly recognise the chaparral-covered hillsides that doubled as Korea in the opening credits. Even better, there’s actually a couple of army vehicles left over from the filming! A wildfire swept through during the original series and there wasn’t enough time to get them out, so now they’re part of the landscape. You start off at Malibu Creek State Park. Take the Las Virgenes Road exit south from the 101, or from the PCH head north up Malibu Canyon Road, which turns into Las Virgenes. The entrance is well signed, and it costs around $5 to park. I recommend the lower lot as it’s usually less crowded, and is closer to the trail head. Take the Crags Road trail from the bottom of the parking lot. Stay on the fire road for around half a mile, and you’ll find yourself near the visitors center. The road continues, with the steepest uphill section of the route. You’ll pass Century Lake on your left once you reach the summit. In the summer it’s a relief to detour to the waters edge, and walk along the lake’s shore. If you look on the other side you’ll see some trees that look out of place. Those redwoods and pines were planted when the area was a privately-owned resort, and their shade is a good shelter from the heat if you make it that far around the lake on the Forest Trail. To get to the MASH site itself, keep straight on along Crags Road for 1.5 miles. 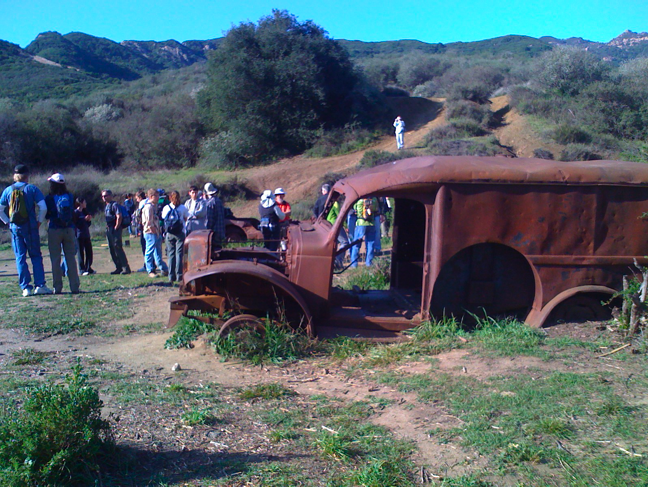 You shouldn’t have any trouble spotting the location, the rusting Jeep and ambulance are right beside the trail. If you’re biking in and want more of a challenge you can continue a quarter of a mile and take the strenuous Bulldog trail that branches off to the left. Be prepared for some relentless uphill climbing for several miles. « What’s the best way to search large amounts of email?